Pearks Grocery Store was situated on the Stratford Road next door to Fosters the mens outfitters on the corner of Radcliffe Street. The picture which was taken in 1958 and was provided by Hilda Webb (nee Horton) of Yardley Gobion. 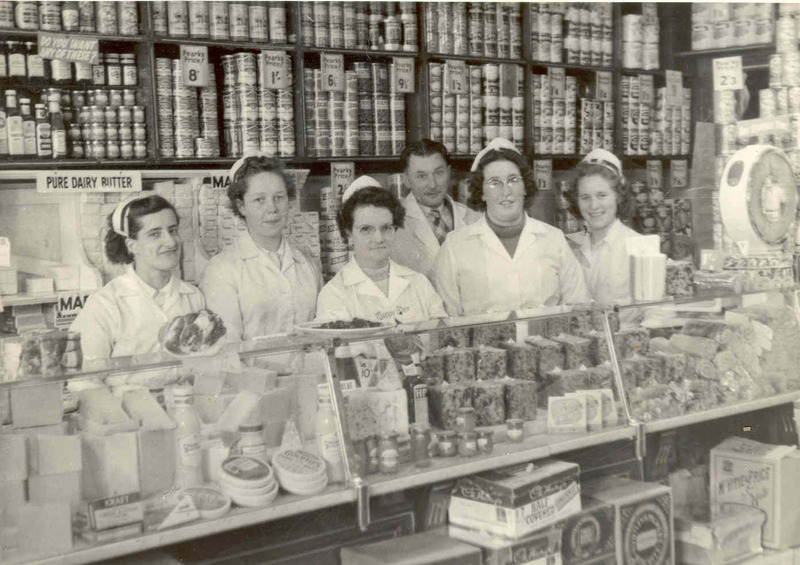 Standing behind the counter from the left are Joyce Callow (now Roberts) – Cakes, Nina Eldred, Hilda Brown, Wilf Stanton – Manager, Hilda Horton (now Webb) – Cheese and Joan Smith. This entry was posted in Heritage, People, Wolverton. Bookmark the permalink. it was great to see a picture of pearks store online, i worked in windsor pearks in 1955 and was sent to london every day for two weeks ror training but cannot remember where in londoni would be grateful if anyone can help. I worked for Pearks, Aylesbury from 1958 to 1964 and, in fact, came to the Wolverton store as a relief manager for just a couple of days as I recall. Mr.Yeo was my district manager. Ron Adams. Roberta, I did that training course around 1960. It was situated not far from Liverpool Street station. The lady who covered stock-sheets etc. was Miss Joyce. We called her Juicy Joyce because she kept using the phrase ” D’you see ? ” Do you remember getting the shop window photo and having to follow it exactly. How about the ‘ 2lb sugar/ 1lb lard ‘ special offers ? Weighing up glace cherries, ground almonds and those sticky californian raisins – weighing and packing every blessed thing, in fact ! Ron Adams. Roberta, did you do the bacon-boning in London ? I’ve a feeling that the teacher had a short leg and that we called him Hoppy, not politically correct now, of course. Pearks were owned by Allied Suppliers who in turn were owned by Unilever. Allied also ran Liptons, Maypole and Home and Colonial all of which had branches in Aylesbury. Daft really, as we all had the same delivery lorries supplying the same goods with four different labels. People used to tell us that Lipton’s tea was far better than Goldtips, but I’d been to the tea factory and watched them change labels mid-stream. I still see Goldtips crockery around, car boots mainly. The training days were a waste of time because most of us knew it all by that time and we treated it as a welcome holiday. Bizarrely, I was asked to go again the following year for a repeat….I went ! I was looking up Pearks Sstores as my father worked for them in 1928 – 1934 ish. I heard lots of tales from my parents. Father was a Manager at Basingstoke when he left. He had been at Eastleigh before that. I am writing a mini biography about my parents Sid & Elsie Greenhead who both worked for many years at various Pearks Grocery Stores. My father was a Store Manager. I am mainly interested in the Pearks store that was at 117 Beulah Road, Thornton Heath, Surrey, above which we lived for many years. I can remember that we entered the flat above via a long passageway that was used to store boxes of various provisions from floor to ceiling and made it difficult for us to gain access to the flat. I would be very interested to know if any photographs of the shop exist and whether there are any records of who worked for Pearks, how long they worked there and at which store. I should also like to know when it closed. Finally, I have just googled Pearks and I note that they are still a going concern in the USA. Are they the same firm ?. There was a Pearks in East Ham High Street. I worked for Pearks store on leaving school in 1960 it was in The market Square in Waltham abbey Essex.My name then was Dorothy Rann. There was a Pearks stores in Wastdale Road Forest Hill London SE23. There is a very nice ceramic tile Name on the building.